• More media mentions! The Atlantic Wire and The Awl both capitalize on the Glenn Beck angle. (We’ve now got audio of that, below.) A rather more personal write-up at Connective Visions, and a nice interview with contributor Pelotard at the Litopia homepage. 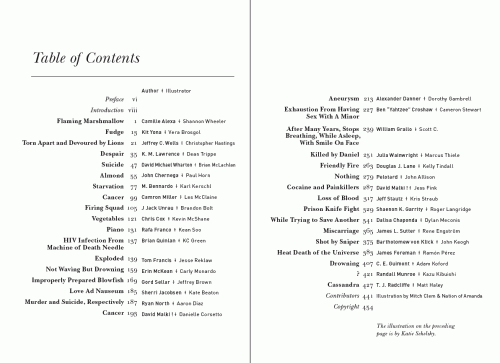 Pelotard’s got exactly the right idea: contributors! Solicit your local press! This is your victory too! • What happens a few days after a bunch of people order books? A bunch of people start receiving books in the mail! We’ve seen tweet after tweet of folks excitedly opening their Amazon boxes to discover our thick, shiny stack of pulp inside. And reading it. And loving it. How cool!! • We had a Facebook event for the Oct 26 launch date, but that date’s now passed. So we’ve set up a new Facebook page for ongoing participation — some people are posting photos, and David made a little prediction photocomic. Anyone who wants to take pictures, or share their thoughts on the book, or discover prediction slips out in the world (as David did! Scarily!) is urged to do so on the new Facebook page! • Here’s the Glenn Beck audio from the 27th. It’s possible he’s mentioned us again — or mentioned taking the top spot in general — in the days since, but we haven’t heard from anyone who’s listened to the program. This bit’s about three minutes long, and of course we posted a partial transcript yesterday. Anyone who knows Roger Ebert or Rachel Maddow, have them drop us a line, willya? And remember that MOD is still under $10 on Amazon if you’re interested in joining the culture of death! 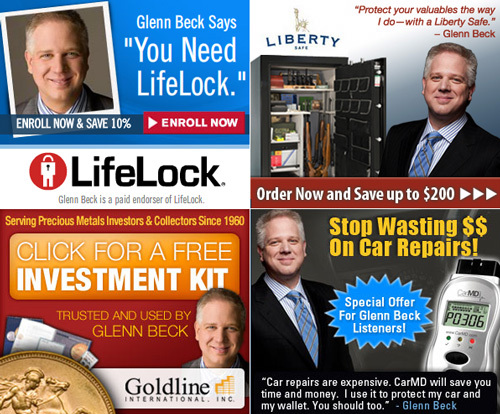 I promise that every new sale is another tiny pea beneath Glenn Beck’s many mattresses. • We’ve been sending out so many confirmation emails to folks who’ve asked us for the free ebook versions (coming soon!) that Gmail has throttled our outgoing mail. This has slowed us down a bit on responses, but rest assured we are still receiving everything fine. Keep sending in those receipts. • Speaking of which, anybody who has, in the past, successfully formatted a Kindle .mobi file and would like to help us, please email us. This is hard UPDATE: We’re set for now! 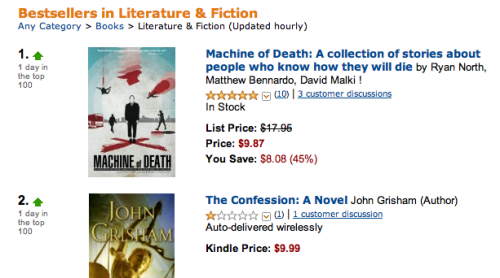 Machine of Death rose to #1 on Amazon and stayed there for over twenty-four hours. We accomplished everything we set out to do. Agents, publishers, retailers, distributors, well-wishers and the press have been flooding our email inbox. I can’t stress this enough: It worked. We won! Once we hit #1, I called an agent I’ve worked with in the past — one who’d tried to sell MOD before but just couldn’t find anyone who wanted it — and he sprung instantly into action. Doors that were once closed started positively flying open before us. Although some big publishers have now approached us about buying the rights and doing a new edition of the book, we have declined. That ship has sailed. We are the publisher. We also realized that we had an opportunity here to gain a level. We could have struck a deal with a publisher, potentially even a lucrative one, that would have been nice in the short term and could probably have led to interesting places. But we have larger goals than just signing a book deal, and we realized we could play the long game here, not just for our benefit — but for the benefit of our friends and colleagues in webcomics as well. And so in the last few days, using resources offered to us that previously would have been absolutely inconceivable, we have laid the groundwork for a complex but amazing publishing/distribution structure that, in the future, should hopefully allow us to get not just Machine of Death, but also all TopatoCo-published and TopatoCo-partnered books into regular bookstore/retail channels, both in the U.S. and abroad. Ryan, Matt and I are harnessing this amazing rising flood-tide to lift all the boats we can find, all the ropes we managed to grab hold of when the waters hit. Much has yet to be settled on this front, so I will simply say it remains a carefully considered work-in-progress and I expect to make more important announcements about this in time. TopatoCo is, of course, the publisher/distribution company that handles merchandise for both Ryan’s Dinosaur Comics and David’s Wondermark, and in the last year or so, TopatoCo’s been publishing great new editions of comics such as A Softer World, Problem Sleuth, Nedroid, Hark! A Vagrant, and most recently Questionable Content. TopatoCo’s business has always been mostly a direct-to-consumer model, but, guys — what we’ve done here has changed everything. We are setting some pretty cool goals for the future, and we absolutely want to drag our friends and colleagues up with us. International folks, check the shipping prices for MOD on TopatoCo. Don’t know how they’ll compare to Amazon — it’s a heavy book — but it might be more reasonable for some, and if you want any other TopatoCo merchandise as well, you can always request a Flat Rate box and cram it full of T-shirts and everything else, amortizing the cost somewhat! Here’s a cleverly-titled post on SLOG, the blog of The Stranger alt-weekly in Seattle (which runs Dinosaur Comics in print, albeit a week ago I noticed that they printed the wrong title on it). Here’s trenchant analysis from Publishers Weekly, or at least a succinct bullet-point version of the highlights of what’s happened over the last few days! ABC News in Australia has also picked up the story, quoting at length the absurd hobos-winning-the-Super Bowl metaphor that Ryan and David rambled on about in our audio message. Something else we learned today! When we picked a release date, we tried to aim for a day far from other major book releases — why invite more competition than we needed to? Unfortunately we don’t know anything about publishing, and so missed the fact that a number of high-profile books also had official release dates of October 26: a new John Grisham book; Keith Richards’ autobiography; a Barefoot Contessa cookbook; etc. Let me put that another way — the books we beat on Tuesday were on their release date. He also apparently has a three-hour daily radio program (well, one hour and forty-one minutes if you don’t count commercial breaks), an hour-long streaming internet program, and an hour-long talk show on cable that he’s been using to push his books. His radio show is full of fancy-sounding commercials like this. But we beat him on his release day. I feel bad! He must have been looking forward to that day so much! Anyway, I’m absolutely certain that our particular brand of bootstrapping, entrepreneurial, small-business-friendly capitalism is right up Mr. Beck’s alley — by all accounts he is an outspoken champion of the little guy, a humble spokesman for the downtrodden. And I want to tell you that, um…our books are ALWAYS #1. And I find it REALLY fascinating, FASCINATING, that if you go to Amazon.com, Broke is number THREE. And the two books that are ahead of it — one is Keith Richards’ Life, which is getting a TON of — you know, that’s everywhere. So that… “culture of death.” And it’s an escape into the past, of, you know, the Woodstock stuff. 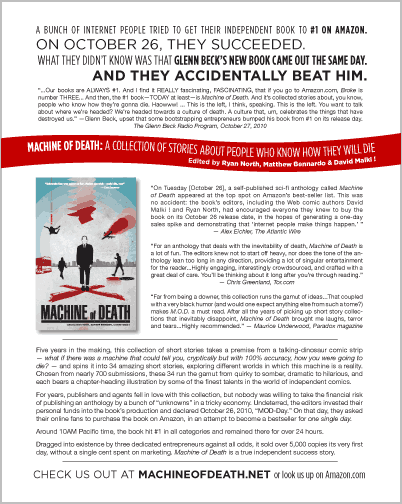 And then, the #1 book — TODAY, at least — is Machine of Death. And it’s a — collected stories about, you know, people who know how they’re gonna die. Haowww! These are the — this is the left, I think, speaking. This is the left. You want to talk about where we’re headed? We’re headed towards a culture of death. A culture that, um, celebrates the things that have destroyed us. Not that the Rolling Stones have destroyed us — I mean, you can’t always get what you want. You know what I’m saying? Brown sugar. I have no idea what that means. UPDATE: The audio has been posted here. In the hours since that program was first broadcast into the ears of legions nationwide, Mr. Beck has gotten his wish and captured the #1 spot. We’re just sad we couldn’t have given him his special day on Tuesday! If you’re reading this, Mr. Beck, we’re sorry about that. We just didn’t even know you were there. Thank you so very much!! Here’s an audio message from Ryan and David. • Ebook versions! We’re accepting your forwarded receipts (from a sale of a print edition) to info at machineofdeath dot net. Specify your preferred flavor of ebook and we’ll have it winging your way as soon as the files are prepared. • The official release date for the PDF version and the first episodes of the podcast is November 2nd. • Amazon has (temporarily?) lowered the price on the book without prompting from us — probably something they do automatically once the title reaches a certain threshold? If the price was an issue before, take another look! • Thank you as well for the very kind mentions at Boing Boing, io9, Bookslut, and thanks to Chris for the incredible review and interview over at Tor.com. • I just want to say that it is really, really exciting to check one’s email and see not one but TWO messages in there from Barnes & Noble corporate bookbuyers. More information on the bookstore situation as it develops! This has been, and continues to be incredible, one of the great joys of our lives to see the superlative groundswell of support that has arisen around this project. We just told you about this a week ago. This is incredible. UPDATE: We are now #1 in all Books > Literature & Fiction overall (beating even the brand-new Grisham Kindle edition that was released today)!! Book previews! The day is here! • MOD on Reddit! I have upboated it. We can’t necessarily make the same offer regarding every ebook format; there are just too many of them. If your Sony Reader or whatever can handle a .TXT file, though, great! Send us your receipt. We’ll look into an ePub version too; I don’t even know what that entails, but we’ll try. If you want to buy the printed book on Tuesday to support the effort, but do not actually want the book itself, feel free to have it sent to us. We’ll donate any books we receive to libraries, schools, use them promotionally, etc. Or, have it sent to a friend! If you want to wait and buy the Kindle version once it goes on sale, that’s cool too. We appreciate the support no matter what form it takes. “EXPLODED,” by Tom Francis. Posted by the author on Google Docs. In the book it is illustrated by KC Green. Many of the authors are working writers with extensive publishing credits: James L. Sutter, Tom Francis, Pelotard, and Jeff Stautz, to name a few. This was Camille Alexa‘s first published story first story written and submitted anywhere. She has since gone on to an illustrious writing career; her short story collection Push of the Sky (which includes her MOD story) is a finalist for the Endeavour Award, given annually to Pacific Northwest authors of science fiction & fantasy. Rafa Franco lives in Argentina; C. E. Guimont lives in Germany; Gord Sellar lives in South Korea; Pelotard lives in Sweden. Daliso Chaponda is a Malawian stand-up comedian and writer currently based in the UK. David Michael Wharton is an editor for Creative Screenwriting magazine. Erin McKean is a lexicographer, former dictionary editor, and the founder of Wordnik.com. Kit Yona runs an auto salvage yard in New Jersey. Yahtzee Croshaw is the creator of the “Zero Punctuation” video-game reviews for The Escapist magazine. Shaenon K. Garrity and Jeffrey Channing Wells, individual contributors, are also the collaborative authors of the comic strip Skin Horse. Randall Munroe is the author of the webcomic xkcd. • Our (free) audiobook will include the voice talents of many of the authors, plus Jesse Thorn, MC Frontalot, Zach Weiner, Lore Sjöberg, Dave Kellett, Kris Straub, Colleen AF Venable, Joel Watson, and one other secret person we’re waiting to confirm. Yahtzee Croshaw reads his own story. It’s the first forty pages (several stories’ worth) and it should give you a pretty decent sense of the quality of the book! • Will you be offering a Kindle version? Ideally yes! 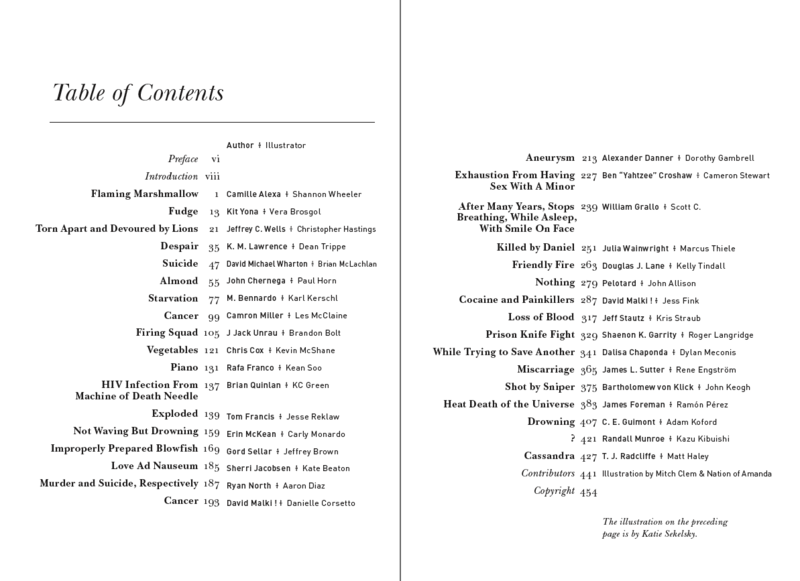 Since hearing many requests for a Kindle version over the last few days, we’ve gotten to work putting that together. Depending on how long the Amazon approval process takes for that, we’ll let you know whether to expect it by Tuesday. 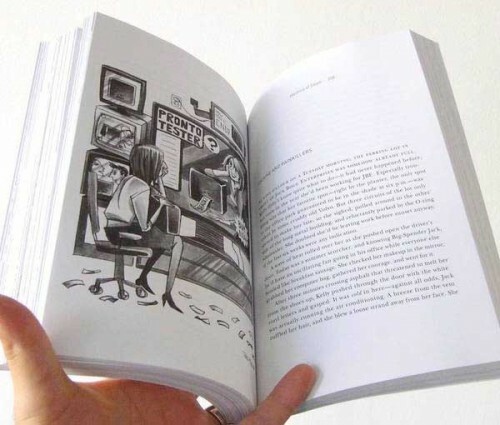 While we’re happy to offer that version for folks who don’t want to deal with a physical book for any of a million great reasons, it should be said that Amazon treats a Kindle book as an entirely separate product from the printed book. Thus, buying the Kindle version doesn’t contribute to the main flash-mob campaign. If we can get a secondary campaign going for the Kindle version, great, that’d be amazing! But we’re also a little concerned about splitting the effort. Here’s an idea we had, and you guys tell us if it’s dumb: if we made the Kindle version 100% free, would people be willing to buy a print copy as well, strictly to help out the campaign and chalk up the maximum number of sales for the paperback? You could have the books shipped directly to us, and we would donate those copies to libraries and schools — so you’d never have to deal with a book you didn’t want, or pay shipping to someplace expensive. Leave us a comment with your thoughts on this idea. To clarify, there’d be absolutely no obligation for folks to buy a print copy; the Kindle version would just be free for anyone who wanted to read the book that way. The other option would be to just charge a regular amount for the Kindle version and make that another sales option. And of course all this is predicated on a Kindle version being approved by Amazon in time. Also I just realized that I don’t even know if you can make a Kindle book free in the Amazon store. So much to learn! • Will the book appear on Amazon.ca / co.uk / other non-American sites? At present time, we have no way of getting it onto the international sites; each territory requires a separate distribution agreement and for the time being, that’s beyond our scope. Additionally, buying from international sites wouldn’t contribute to the main campaign because it’s a different product as far as Amazon is concerned. You can buy from Amazon.com for shipping to foreign addresses, but we know shipping sometimes becomes a headache. It’s a less-than-ideal situation, we know, but it’s what we have to work with for the moment. The book will be available through our own e-store, shipping worldwide, starting in November. • What time specifically should we focus our sales on? In which time zone? The more concentrated the sales, the better, but beyond a certain point that’s impossible to manage. Let’s just say roughly the period of business hours in North America. So for Europeans, that’s afternoon and evening on the 26th; for Australians, New Zealanders, and others in that region it’d be early morning to afternoon on the 27th. But anywhere in that ballpark is totally fine! More questions? Ask ’em in the comments!